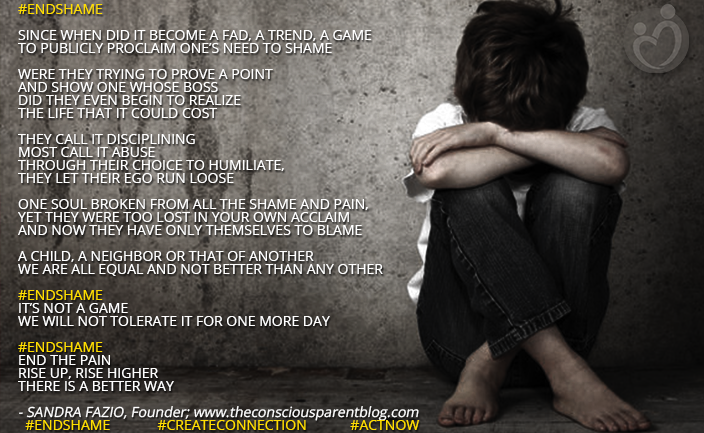 Here is a 2nd video by Dr. Shefali Tsabary, author of The Conscious Parent, to support the #ENDSHAME and #CREATECONNECTION #ACTNOW Movement. In this video below, Dr. Shefali shows how we can TRANSFORM SHAME. Let’s use this calling as an opportunity to come TOGETHER as a community for our children’s sake – it’s TIME to TEACH from a CONSCIOUS mindset. #ENDSHAME for the sake of all humanity. Thank you for helping to be a steward in changing the world for our children. Please SPREAD THE WORD through all your social media efforts – Facebook, Twitter, YouTube, Instagram!